After you have finished the mechanical assembly of the robot, the "Locomotion Firmware" can be installed on the robot board. This is responsible for the running behaviour of the robot. Are all servos connected correctly (polarity)? Are all servos mechanically in the middle? Is the Gamepad controller connected? Is there enough space available for the robot, even in the event of a malfunction? Now connect the battery to the robot board, if not already done. Connect the robot board (connection "PRG-M") to your computer as already done. 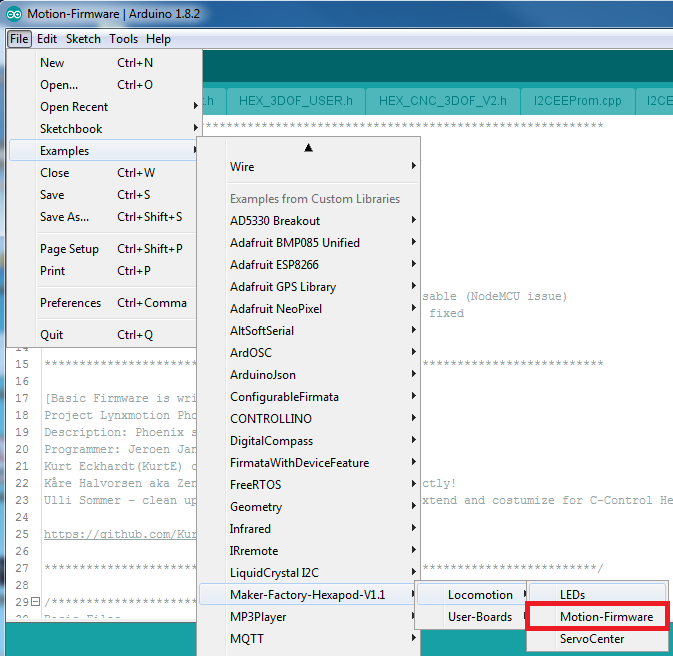 Then select in the Arduino IDE in the Hexapod examples the programme "Motion Firmware" (located under "Locomotion"). Transfer the programme to the robot board as usual.